Nowadays welded steel pipes have the same or better mechanical properties as seamless pipes. The high quality is achieved by continuous recording of the welding and calibrating equipment parameters. The outer and inner weld bead of the pipe is scarfed smooth immediately after the welding process. The seam should be level with the surrounding area and the wall thickness consistent in direction of the circumference. 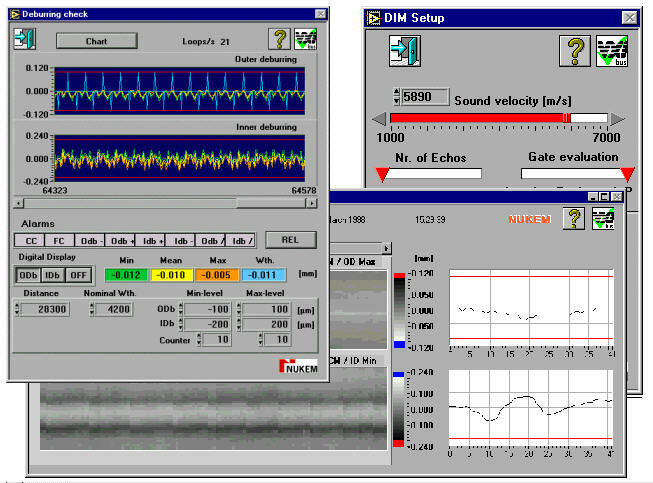 The inspection system "Scarfing Monitor", designed by NUKEM Nutronik, allows a constant monitoring of the outside and inside scarfing process. .
An ultrasonic compression wave probe scans across the welded seam, measuring the elapsed time between the entry echo and back wall echo. The resulting time is evaluated by means of an industrial PC and digital testing equipment UTxx. The current outer and inner contours are displayed continuously on the monitor. If the weld profile exceeds the previously adjusted tolerance limits, the UTxx software gives out alarm signals. 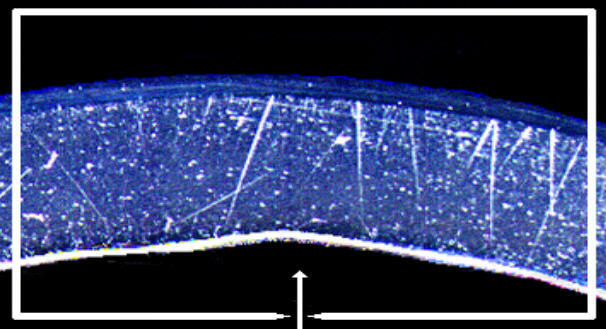 On the right part of the upper diagram the current outer (top) and inner (lower) weld profiles are shown. The red lines represent the preset tolerance limits. In addition to displaying a two color profile diagram with continuously updated data, rapid feedback of scarfing process tendencies is also supplied to the mill operator. Tolerances exceeding the presets are marked in red and those under the presets are marked in blue. Changes such as scarfing tool breakage, trim not within the tolerance limits, or an unusual wear are detected immediately and can therefore be eliminated. The NUKEM Nutronik "Scarfing Monitor" operates in contact mode with a slide shoe, as well as in non-contact mode without a slide shoe. However, a fixed longitude of the pipe is necessary. The width of the scanning path is mechanically adjustable. 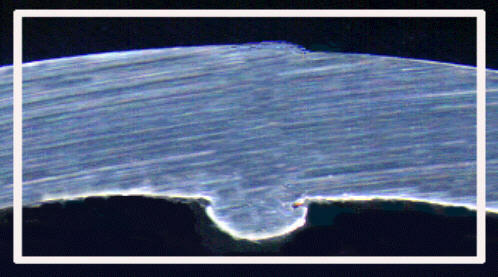 The probe scans across the weld seam two times per second. As an additional option, the "Scarfing Monitor" can be equipped with variable oscillating frequencies. A pre-running sensor with pneumatic valve protects the probe in the event of critical geometric mis-alignments of the weld area such as burrs, high transverse joint welds, or large holes. 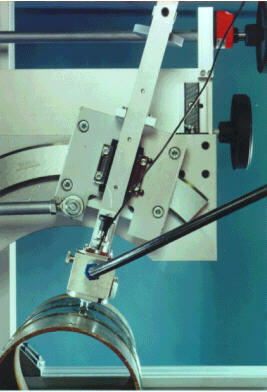 The probe holder is lifted pneumatically when necessary. The "Scarfing Monitor" can be integrated into calibrating equipment of the existing production line or separately installed with its own water circulating system. The equipment requires approx. 500 mm along its axis. For ultrasonic inspection the channel-oriented digital testing equipment UTxx from NUKEM Nutronik is available. The standard 19"-rack system with VXI-bus uses 12 distinct testing channels. This upgrade can be easily carried out using an additional frame with bus interface. For single channel tests NUKEM Nutronik offers the "Stand-alone" variety, the UTxx Basic. This variety can be operated through standard PCs or workstations with Windows capabilities.